John Denton's history of Cumberland, compiled in the first decade of the seventeenth century, formed the basis of almost all antiquarian writing on Cumberland for some two hundred years, and continues to be cited. It is the earliest known attempt to write a history of Cumberland and one of the first generation of antiquarian accounts of an English shire. 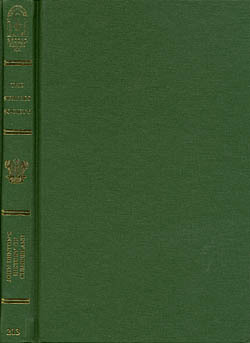 This volume presents a completely new, critical edition of the manuscript history of Cumberland, replacing that published in 1887 by Richard S. Ferguson under the title An Accompt of the most considerable Estates and Families in the County of Cumberland ( hitherto the only published version). The new edition attempts both to reconstruct as much as possible of the original text from surviving copies and to identify the sources from which it was drawn, enabling the factual accuracy of Denton's work to be assessed. Angus Winchester is Senior Lecturer in History at Lancaster University and a Past President of Cumberland and Westmorland Antiquarian and Archaeological Society.